For the album by Joe Bonamassa, see Sloe Gin (album). 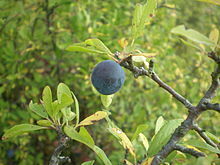 Sloe gin is a red liqueur made with gin and sloe (blackthorn) drupes, which are a small fruit relative of the plum. Sloe gin has an alcohol content between 15 and 30 percent by volume. However, the European Union has established a minimum of 25% ABV for sloe gin to be named as such. Sloe gin is technically a gin-based liqueur, but due to historical prevalence at the time of writing the EU spirit drink regulations the colloquial name 'sloe gin' was included in the legal definitions and as such is the only gin-based liqueur that can legally be called gin without the liqueur suffix. The traditional way of making sloe gin is to soak the sloes in gin. Sugar is required to ensure the sloe juice is extracted from the fruit. Many commercial sloe gins today are made by flavouring less expensive neutral grain spirits, although some manufacturers still use the traditional method. U.S. distilleries often use close relatives of the sloe, such as the Aronia berry or beach plum, to produce a domestic version of sloe gin. Sloe gin is made from ripe sloes, which are traditionally picked after the first frost of winter (late October to early November in the northern hemisphere). Each sloe is pricked, traditionally with a thorn taken from the blackthorn bush on which they grow. An alternative folktale says that one should not prick the sloes with a metal fork unless it is made of silver. A modern variation is to pick the sloes earlier and freeze them. A wide-necked jar is filled half way with pricked sloes and 4 ounces (110 g) of sugar is added for each 1 imperial pint (570 ml) of sloes. The jar is then filled with gin, sealed, turned several times to mix and stored in a cool, dark place. It is turned every day for the first two weeks, then each week, until at least three months have passed. The gin will now have a deep ruby red colour. The liqueur is poured off and the sloes discarded, or infused in white wine or cider, made into jam, or used as a basis for a chutney or a filling for liqueur chocolates. The liqueur can be filtered, but it is best decanted back into clean containers and left to stand for another week. Careful decanting can then ensure that almost all sediment is eliminated, leaving a red liqueur that is not cloudy. Recipes for sloe gin vary depending on the maker's taste. The sweetness can be adjusted to taste at the end of the process, although sufficient sugar is required while the drupes steep to ensure full extraction of flavour. When made sufficiently slowly, the alcohol extracts an almond-like essence from the sloes' stones, giving sloe gin a particular aromatic flavour. However, some recipes use a shorter steeping time and include a small amount of almond essence. Another common variation is the addition of a few cloves and a small stick of cinnamon. In North Yorkshire, Masons Gin distill the sloe berries in the gin as opposed to the traditional infusing the berries in the gin after distillation. A sloe gin competition is held each January in The Pandy Inn, Dorstone, Herefordshire, with the winner crowned the "Grand Master of the Sloes". There were 30 Sloe Gins entered in the 2015 competition. They were sampled and scored on colour, clarity, taste and quality by over 50 willing judges. There are also the Sloe Gin Awards in Hebden Bridge, West Yorkshire, which are held annually and include gold, silver and bronze awards. There is also an annual competition for locally produced sloe gin in Knighton, Powys. The George Inn in Frant, East Sussex, near Royal Tunbridge Wells, plays host to the annual Sloe Gin World Championships in December. In Germany and other German-speaking countries, Schlehenlikör is made by soaking sloes, sugar, and possibly some spices in vodka, gin or rum. The most popular commercial brand, Schlehenfeuer, based on white rum, is made by Mast-Jägermeister SE, better known for its product Jägermeister. In Spain, patxaran is made by soaking sloe drupes in an anise-flavoured spirit, resulting in a light reddish-brown, sweet liquid, around 25–30% alcohol by volume. In Italy, bargnolino is made by soaking sloe drupes with sugar and spices in spirit alcohol (recipe varies locally), resulting a reddish, sweet liquor, around 40–45% alcohol by volume; it is often chilled before serving. In Poland, tarninówka is an infusion (nalewka) of sloes in vodka or rectified spirit. Slider is still cider in which the sloes used to make sloe gin have been steeped; it is a Devonshire tradition. Sloe whisky and sloe brandy are variants on the tradition, and are often mixed with ginger beer or ginger ale. ^ EU spirits regulation(PDF) Regulation(EC) No 110/2008 of the European Parliament and of the Council of 15 January 2008 on the definition, description, presentation, labelling and the protection of geographical indications of spirit drinks and repealing Council Regulation (EEC) No 1576/89, Appendix II No. 37, Retrieved 2014-01-31. ^ "News: Green Hat Gin". New Columbia Distillers. Retrieved 10 July 2017. ^ Martineau, Chantal. "America's Answer to Sloe Gin". Food Republic. Retrieved 10 July 2017. ^ St Leger, Henry. "The 6 best gins you've never heard of". The Gentleman's Journal. Retrieved 8 April 2019. ^ "Golden Valley annual Sloe Gin Competition prepares for kick off". Hereford Times. 2011-01-11. Retrieved 2011-01-24. ^ "Dorstone Sloe Gin Competition 2010 - judging this Friday". Hereford Times. 2010-01-20. Retrieved 2011-01-24. ^ "Sloe Gin Awards". Retrieved 2012-01-09. ^ "Sloe gin makers gather for contest". 16 December 2015 – via www.bbc.co.uk. ^ "Sloe Gin World Champion Announced! - Produced in Kent". producedinkent.co.uk. 22 December 2014. ^ "Sloe Gin Tasting – A Comparison of 17 Sloe Gins". summerfruitcup.com. 25 November 2010.